Rock Paper Lizard: Muskrat lunch. What catastrophe has befallen these cattails? Last week they were mostly vertical. Now a large number have toppled. Aha! 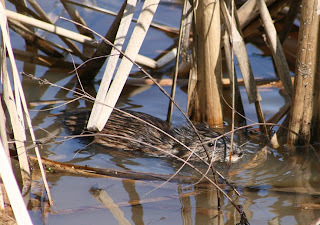 Ondatra zibethicus (for some reason, one of the few Latin names I remember from mammalogy class), the Muskrat. It's not a rat; it's a relatively large member of the Family Cricetidae, which in North America also includes voles and lemmings. From Wikipedia: Muskrats, voles and lemmings are in the Subfamily Arvicolinae [of the Cricetidae], whose members are most easily identified based on their molars, which show prismatic cusps consisting of alternating triangles. [Not so easily done, even if you knew what prismatic cusps were, in live, half-submerged ones.] These molars are ever-growing and are well adapted to herbivory. 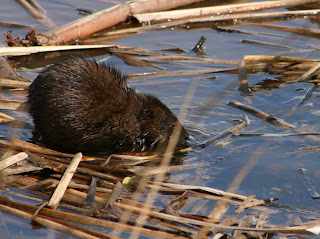 The relatively large size of muskrats is thought to be an adaptation to an aquatic lifestyle. 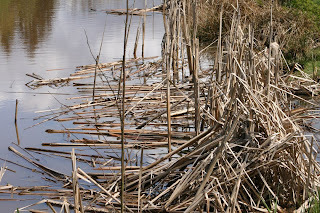 Oh yes, and muskrats eat, among other things but very high on the preferred-eats list, cattail roots. There was a pond at a nature centre not far from here that was in constant danger of being choked into damp oblivion by cattails. Every summer, volunteers in waders or dangling precariously from dingies worked hard to yank a good portion of them out. It was a very messy job, and still, by fall, open water was nearly gone. And then, a muskrat appeared. Over the course of a year, the cattails were completely eradicated. Its work done, the muskrat left too. And then sedges that nothing ate moved in. That was about it for the pond. It's now a muddy sedge-meadow. I have gotten down this far and have run out of time. But, I wanted to tell you I think your blog is very entertaining and attractive. I especially like those that include birds, bugs, animals, pets, kids, as well as, plants and gardens. Enjoyed my visit very much. I found you on Blotanical. I will be back from time to time.